Follow us on our "Puppy Photo Blog" ! 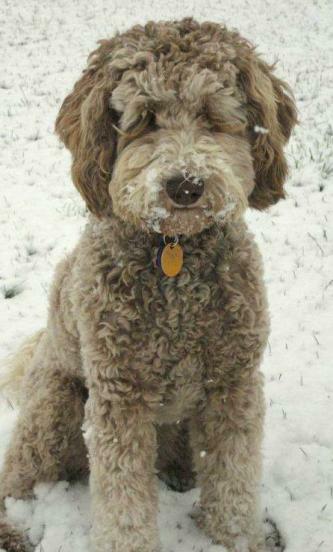 "Kristin from Golden Gate Labradoodles is a wonderful breeder. She takes great care in each one of her puppies and have continued to help guide and support us as we raise our puppy Gretel. We feel so lucky to have been able to purchase our puppy from Kristin. The exposure and socialization Gretel had before she even came home was amazing. The fact that the puppies are born and live their first two months in Kristin's kitchen make them a wonderful family pet. Gretel loves to be around people and has the most charming character. We absolutely love our puppy and cannot begin to thank Kristin and her family for all that they have done for us. We cannot recommend them more highly!" "Kristin at Golden Gate Labradoodles is so extremely knowledgable about the Australian Multigenerational Labradoodle breed...and about dog rearing, in general! Not only is she familiar with breed standards, options, personality and health traits, but she provides excellent guidance on issues such as basic obedience training, grooming, nutrition and helping pups make the adjustment to a new home. We couldn't be more thrilled with the health, intellect, adaptability and affection of our little girl, Maisy. 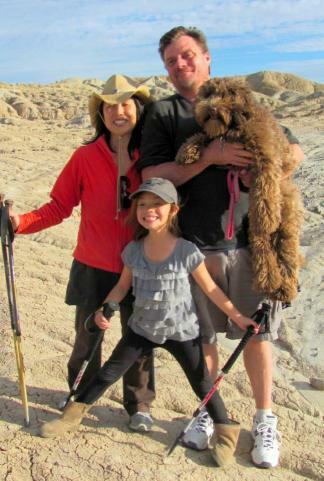 She is a far more amazing canine companion than we ever could have hoped for." 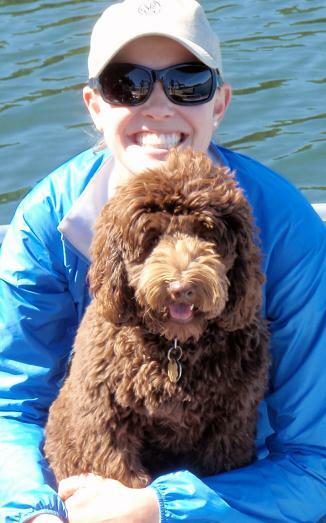 "We are extremely happy with Sawyer and we owe it to you and your knowledge of Labradoodles, that he is the PERFECT match for our family." "From the moment I first met Kotah I knew he was special. I was not looking for a Labradoodle at all, but there was something so special about him. From the beginning, Kristin was very helpful. As soon as I contacted her, she was sharing website information about the breed and educating me about these special companions. My main goal was to find a healthy puppy, that liked other dogs and cats, was easy to train, and was big enough to play with my 13 year old son, yet not as big as a lab. Kotah fit the criteria. He is such a joy and I can’t imagine our family without him!" No sales pressure: Kristin genuinely wants to match you up with the right puppy. I had the deposit check ready from the first in-person meeting and she simply would not take it until she had completed her health guarantee paperwork. She was also waiting for the puppies to mature a bit to assess them. Many breeders want the deposit check for a future litter before they will even return your phone calls. Depth & breadth of knowledge on the breed: She genuinely loves the breed and wants to maintain the highest level of standard for look and temperament of Australian Labradoodle. Any question I have about Emmy on things she's doing, behaviors, habits, training, grooming tips, I go to Kristin and I'm assured of getting a thorough instructions and suggestion things to try or why she does these things. Access to an Expert: Not only is she knowledgeable but Kristin wants to share her knowledge and help you as the new owner. You can ask her anything and she calls you right back with helpful suggestions. In fact, I spent an hour and a half in Kristin's garage yesterday learning to groom Emmy myself using the clipper after a disastrous visit to the professional groomer. She is that accessible. She showed me how to groom Emmy, get the mats out, products that might work for her. Sample products I should try. No, she's not trying to sell me any of this stuff. She just wants me to try stuff that might work for my dog. Complete Trust: Lastly, having talked to many many breeders over 6 months that I was researching the breed of the dog that I wanted to get for our family, I ran across a lot of breeders. With some of them, you get the feeling that this is their livelihood and financial transaction trumps in the end. They say the right things but it seems a bit hallow. From the time we had our first phone conversation, subsequent in-person meetings, visits to see the puppies, I had complete trust in Kristin. In fact, one of the families that had a deposit with one of the puppies then changed their mind, Kristin had no problem giving them their deposit back. She did not want the puppy to go to a family that may not have been the best "fit" for that puppy, she made an exception. I don't know other breeders that would do that. Since technically, if you change your mind, the breeder has every right to keep the deposit. Hello, that's why they call it "deposit." At the end of the day, you are paying thousands of dollars for these pups and you can be assured that you are doing business with someone who is completely trustworthy and will go above & beyond to ensure that you are matched up with a puppy that will "fit" right in with your family. 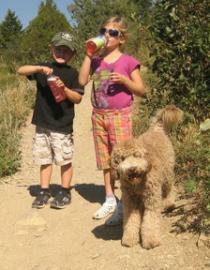 If we were to add another Australian Labradoodle to our family, I would not hesitate to work with Kristin again. I have also recommended her to all my friends and family. You will not be disappointed.